Q1: Do you make all your furniture, lamps and accessories yourself? Answer: Yes, all our furniture, lighting and accessories are hand made by David Lees, an English Master Craftsman with over 30 years experience. Q2: Do you make your products in any woods other than oak and can I order a custom piece? Answer: Yes, although most of our products are constructed using quarter sawn white oak, we can use other woods if requested by a customer. If you would like a piece custom made to your exact requirements and specifications we will be happy to oblige. Q3: What is 1/4 Sawn White Oak and why do you use it in the construction of your products? Answer: 1/4 Sawn White Oak refers to the method of cutting the boards from a log. 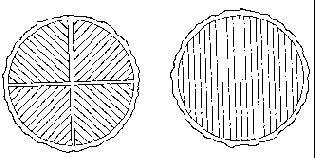 Instead of the usual sawing method the log is cut into quarters and then milled. This less efficient method results in a more stable and attractive board. Crestwood Design uses 1/4 Sawn White Oak because of its natural beauty, unique markings, stability and strength. Q4: What is Arts & Crafts Style? Answer: The Arts & Crafts Style originated in England in the 1800’s as a rebellion against Victorian mass production and industrialization. In North America this style was adopted in the Mission Style of furniture and is also often referred to as Craftsman Style, American Bungalow Style, and California Bungalow Style. No matter what you call it, the Arts & Crafts Style offers clean lines, traditional craftsmanship, natural beauty and timeless design. Click Here to learn more about the Arts & Crafts Style. Q5: Is your furniture made from solid wood? Answer: Yes, all our furniture is constructed from solid wood using 7/8" thick boards, we do not use veneers. Q6: Is your furniture reproduction? Answer: Although many of our pieces have been inspired by original Arts & Crafts designs we do not consider our furniture to be reproduction, instead we are creating an original Crestwood Design piece for our customers. All our products are hand made and nothing is mass produced. Q7: What is the delivery time for a piece and how do I place an order? Please see our ordering & delivery page for more information on how to place an order and contact us for our current lead time. Q8: Can I have a piece of furniture upholstered in fabric instead of leather? Answer: Yes you can, please contact Crestwood Design for further details about upholstery options or click here to see our upholster options. Q9: Can you ship to anywhere in the US and Canada? Answer: Yes, we can ship to anywhere in the continental US and Canada. If you live outside of Canada or North America please contact us regarding your shipping requirements. Q10: Are there Duties and Taxes applied to products I purchase from Crestwood Design? Answer: If a product is shipped to a Canadian address outside B.C. then no PST is charged only GST. For shipments to a US address there are no Canadian sales taxes applicable. However, you may be subject to Taxes from the state you live in that Crestwood Design is unaware of. Q11: Do you provide a Guarantee with your products? Answer: Yes we provide a comprehensive Guarantee against defects in craftsmanship and materials with every product. Each piece also comes with a certificate of authenticity. Q12: Are you committed to the environment? Answer: Crestwood Design is strongly committed to the environment. We only use timbers that are supplied from a renewable resource to ensure that future generations can enjoy our natural resources. All our products are created using only environmentally friendly products. Crestwood Design also plants a large number of Trees each year to ensure we remain carbon neutral.